2019 MARFC 2nd Annual Charity Fundraiser & Bowling Tournament in the Books! Our 2nd Annual Charity Fundraiser & Bowling Tournament held on February 23, 2019 was a great event! 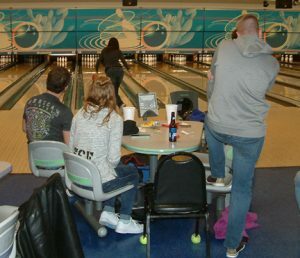 We had over 30 bowlers on hand who all had a great time. A grand total raised for both the American Cancer Society and our Randall Ginter Benevolent Fund was $888.00 with half going to each charity. Thanks so much to all involved in helping set up and during the event. 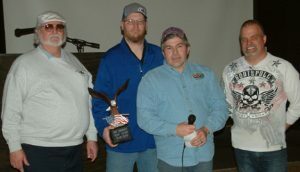 Winners of the tournament were: Men’s High Score Jon Oakley, Women’s High Score Susan Lightner, Team High Score Dan Lightner and Cindy Lee, and the Greg Yost Never Give Up Award for lowest score went to Sean Sprague & the Sprit Award sponsored by Chris Throgmartin went to Jason Partanen for his contributions to the racing community. Congratulations to Dan Lightner for winning the Ultimate Man Cave raffle items and to MARFC Member Rusty Daggett for winning the Larry Loynes Memorial Silent Auction items. And to Elaine Crosby for donating her 50/50 winnings back to the event for the cause. Thanks again to Chuck Darling for work hard to put this event together for us. He is a great supporter for racing across the state. Special thanks to the Capitol Lanes in Owosso for all their help for this event. Once again thanks to all the folks who donated items or funds to help make this event a great success. 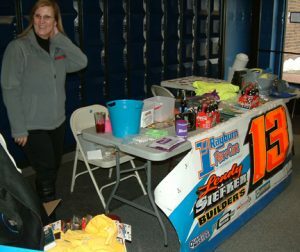 Thanks to Elaine Crosby, Gary Angle, and Ann VanDeusen for working the ticket sales and raffle table. Also, thanks to Destiny Howey for keeping track of all the scoring. Thanks’ also to the new owners of the Owosso Speedway Ken & Jerry Williams who can by to support our event and Ken informed our group of some of the updates they are planning for the speedway for this season. We wish them well and are glad they are racers at heart and will continue to keep our sport alive by not seeing that another track close. MARFC 53rd Annual Awards Banquet Recap! 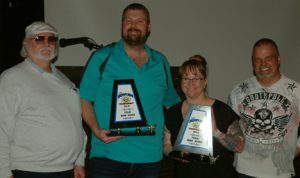 Sorry for the delay on the 2019 53rd Annual Awards Banquet Recap! Been quite a whirlwind this past month. So here we go! Just over 400 folks braved through what Mother Nature had for us that evening and all had a great time once they arrived. Randy “Wolfman” Adam started out a little slow but, picked up the pace and by the time he was finished we did 100 in just about an hour. Great Job Randy! Our top award winners were: The Presidents Awards to Stanton Nawrocki aka Rocky Fisher. Longtime MARFC member and open wheel racer as well as belonging to several racing hall of fames was on hand with his entire family all the way for Fort Wayne, Indiana. Our Vito LoPiccolo Memorial Award winner Ron Drager was on hand to accept his award and was greatly appreciative of the award named after his good friend Vito. Vito’s daughter Linda was there to help with the presentation. 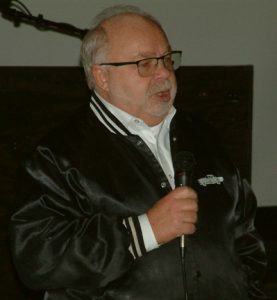 Jack Hewitt was unable to be at the banquet be sent his greatest thanks to MARFC for the 2018 Eddie Sachs Memorial Lifetime Achievement Award. Fox Sports Broadcaster Matt Yocum also made the trek up to Michigan to receive our MARFC Media Award for 2018. Matt talked about the grass root racing here in our state as well as the younger kids coming up in racing especially the young ladies. He said there was a time the ladies didn’t even come to the races and now they are a main part of our sport. MARFC Special Appreciation Awards went to long time member Jack Oakley who donates his time to video tape many of the racing here in Michigan for the racers and fans who love our sport just as much as he does. 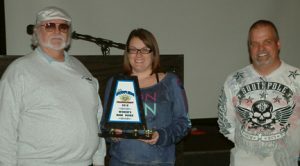 Next John & Kathy Naida were presented an appreciation award for the many years of service they gave to the SOD Sprints on Dirt Series as they plan on passing the torch to new owners this season. 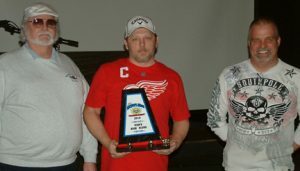 Then our Special awards were presented to: Arthur Raceway as MARFC Promoter of the Year, with Jimmy Tucker taking home the MARFC Mechanic of the Year honors. MARFC/ Randall Ginter Fan of the Year went the longtime member John Grzeck for his loyalty to the club and the many events he attended this past season. 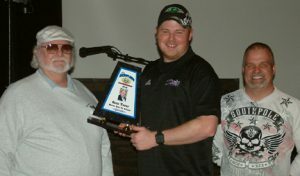 MSPA Promoter of the Year Award was presented by MSPA President Ron Drager to Gary & Donna Howe of the Kalamazoo Speedway. MARFC Appreciation Awards were also handed out to Barb Gullett for her work on our annual children’s Christmas Party as well as working hard as Secretary/Treasurer of our club. Rick Kilborn, Tyler Moore, Matt Szecsodi & Caiden Baily were all given awards for bringing their racers through the snow infested weather and have them on display. Thanks to all the helpers who assisted setting up and taking down for the banquet. We here at MARFC are sending out our best and warmest wishes that everyone fans, racers, sponsors, and track owners a very HAPPY NEW YEAR of Racing in 2019. May we all be blessed with good health, great weather and some of the best racing in the country right here in our Great state of Michigan. Once again Happy New Year to all! 2019 MARFC at Toledo Speedway!